Himalayan Bird-Lip Orchid is a very interesting orchid which, outside of the flowering period, is almost indistinguishable from Phalaenopsis orchids. 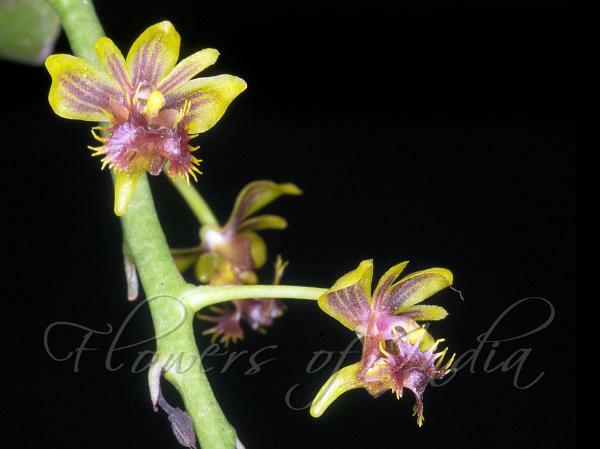 However, its tiny 1.5 cm across flowers are of an absolutely different and interesting appearance. The base of the lip is a foothold for a short and massive wine-red spur. The lip is marked by a notable radial forking. A large number of flowers grow on overhanging spikes. Leaves are nearly basal, usually 2 or 3. Leaf blade is oblong-elliptic or obovate-elliptic, obovate, or oblong, 7-19 × 5.5 cm, tip blunt, pointed or long-pointed. 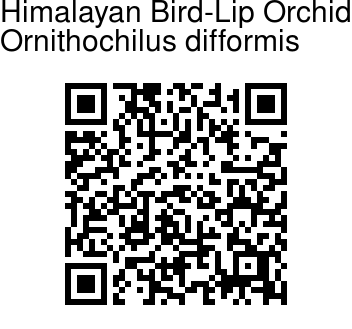 Himalayan Bird-Lip Orchid is found on tree trunks in open forests or at forest margins in the Himalayas, from Uttaranchal to Burma, Thailand, Laos and Vietnam, at altitudes of 500-2100 m. Flowering: May-June.